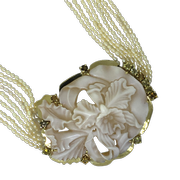 Lillium flower cameo suite or parure, set in 18kt yellow gold, with Japanese Akoya pearls accenting the cameo earrings and natural CFW (Chinese Fresh Water) button pearls forming the necklace. The three cameos in the necklace are trapezoidal in shape and measure 35mm, 37mm, and 40mm (center). The cameos in the earrings are elongated ovals and measure 23mm each. Registry numbers 1591,1592,1593 (necklace), 1662 and 1663 (earrings). Eco-friendly, Fair Trade. Sold with a Certificate of Authenticity.